It's hard to imagine a more timeless piece of jewelry than the diamond stud. This earring design is simple but incredibly versatile, because it includes a limitless combination of carat counts and cuts, and it goes with absolutely anything. It even has a rare unisex appeal, with off-and-on trends inspiring men to wear one or two diamond studs. Though, this classic choice isn't nearly as old as diamonds themselves, and not many people know its origins. 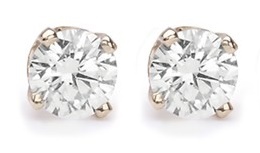 So when did the solitaire diamond earring first emerge as a popular piece of jewelry, and why? What is a Solitaire Diamond Earring? The most common example of a solitaire diamond is the classic diamond engagement ring, which features a single diamond in a precious metal setting. The solitaire setting simply applies to any single diamond with no accompanying gems or smaller diamonds. Therefore, diamond studs are technically solitaire diamond earrings. The design is simple and classic, but studs may vary wildly in carats, settings and cuts. For example, a pair of heart-shaped diamond studs are feminine and playful, while cushion-cut and princess-cut diamonds offer stronger lines a and more sophisticated effect. Today, diamond solitaire earrings are available in every jewelry store and ear-piercing salon, but they weren't always a fashion fixture. By most accounts, Mary of Burgundy received the world's first diamond engagement ring in 1477. Just a couple decades earlier, the inventions of facet cutting and polishing had unlocked the decorative potential of the diamond. However, earrings had already been around since 2500 BC, when royal Egyptians wore hoops, plugs and pendants. These traditions finally converged on a massive scale in the 1800's, when the open-back claw setting made it easier for jewelers to mount single gems and show off their brilliance. The diamond is the star of the show in solitaire designs, so if you're looking for a pair of exquisite solitaire earrings in Houston, follow the high-quality diamonds. Inter-Continental Jewelers offers dozens of spectacular selection solitaire earrings, ranging from quarter-carat diamonds to flawless five-carat diamonds. If you're choosy about clarity, color, shape or setting, Inter-Continental Jewelers has the selection you should shop.